DOGLOVE - for the love of dogs (and cats too! ): Delta Update long overdue! The day after Delta's birthday, a stitch broke through her skin. 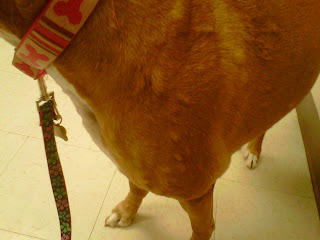 I felt she was swollen, and as the bleeding wasn't stopping, she went to the animal emergency to get looked at. 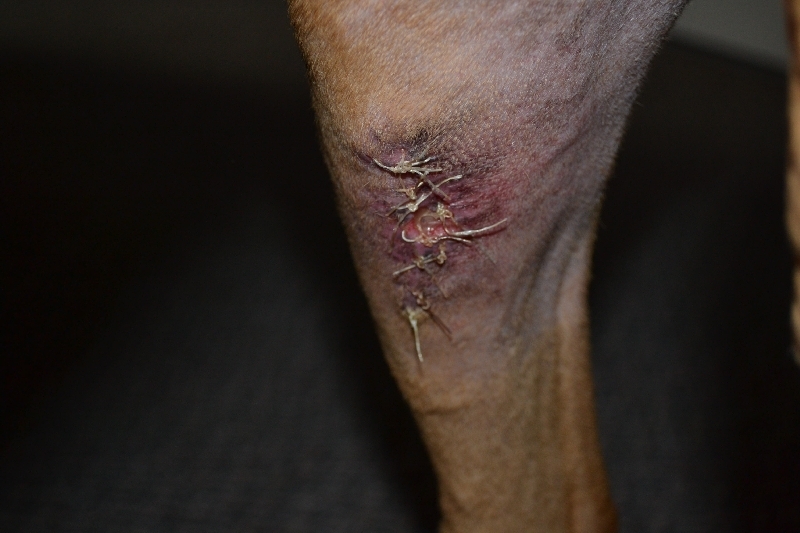 The tissue was starting to heal so the vet didn't want to add a stitch/staple back in. 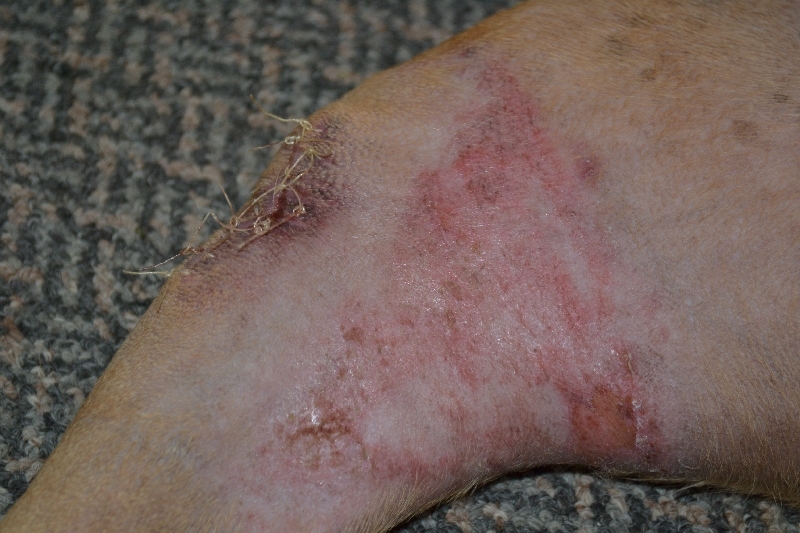 She seemed to be on the verge of infection however, so antibiotics were prescribed and her leg was wrapped up for a couple more days. I grew progressively concerned about her broken stitch and bleeding, so on January 21st we were in to the vet, where I assisted her with adding an additional 3 stitches in place. 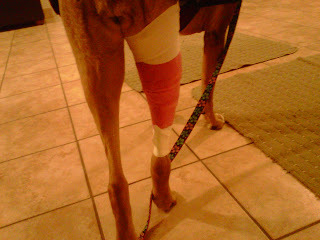 Not surprising, I was told no more bandages in order to allow her leg to heal. I was given Fuciderm gel for that, and Metacam for her pain. She broke out in hives the next day, full blown on Monday evening. 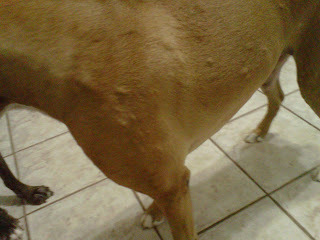 She received Benadryl (but not Dexamathasone as she'd had Metacam within the past 3 days). 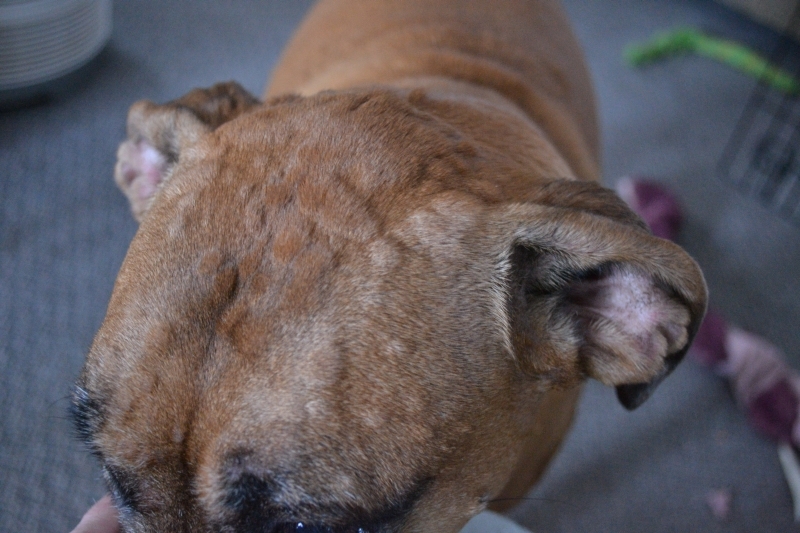 She also received Benadryl pills for me to give her each 8 hours, so I stayed home from work. On Tuesday morning she seemed better at first, but then she broke out again after breakfast. 1/2 hour later, and I called the vet. They advised me to discontinue the Cephalexin antibiotic she had been taking since the Emergency visit, and I also discontinued using the Fuciderm. The hives continued periodically. On Wednesday, the vet gave her the Dexamathasone, and advised me that she wasn't so much concerned about the hives and the incision any longer; she was more concerned about both of Delta's ears, which were on the verge of aural hematomas from head shaking wearing her cone. So, no bandage to protect her her incision. No bandages to protect incision and catch the weeping. No cone to keep her from licking her incision. What I did do was put a very light self-sticking tape wrap over gauze for the next 2 days. I also dabbed some Bitter Orange cream on the bandage to discourage her from licking. The wrap slid down her legs a bit, but seemed to do the trick. 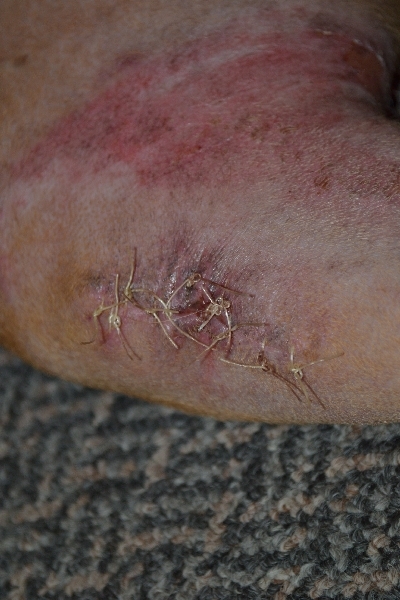 Of the 3 new stitches, 2 of them ripped through. 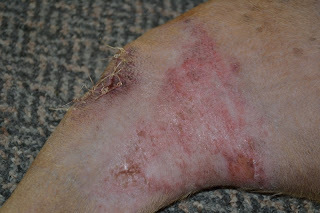 But her skin was looking much better after a few days. 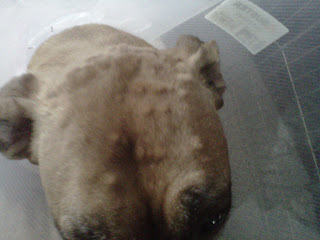 Finally, the stitches came out and she's now fully healed at long last!! She had some occasional hives prior to stitch removal and I am beginning to believe that it was mostly stress for paying such close attention to this awful thing. I thought perhaps she developed a chicken allergy as well as an allergy to the antibiotic. Time will tell (I've eliminated chicken for now but plan to try some with her again). I hope this is the end to her medical dramas and that she can live the remainder of her life stress-free!